It’s no secret that you have to be cautious when exploring online money making websites. The anonymous nature of the Internet means it’s the perfect place for people to try and take your hard earned cash. At OddsMonkey, we feel this is a real problem, and people are missing out on life changing opportunities as a result of their natural skepticism. So we’d like to share our top 6 tips for making sure the opportunities you explore are legit. Seems pretty obvious, but so many people fail to use Google in the right way. Take OddsMonkey as an example. You land on our site, it looks fantastic (and maybe even almost too good to be true). People think to themselves “surely making £X per month isn’t really that easy?”. That’s a natural response. 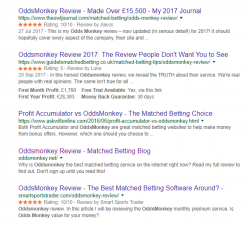 But by simply Googling ‘OddsMonkey’, you can view the results which speak highly of our service. As you can see in the above screenshot, there are tonnes of reviews, and that is just the first page. Make sure the company have a presence on Google. Zero Google presence is something to be wary of. If nobody is talking about them, they are either new and without a track record, or simply, nobody is talking about them because they’re not worth talking about. Weigh up the number of good and bad reviews, rather than being put off by just one bad review. Even the best companies have customers who may prefer a rival. Just as you may be in the Apple camp or the Android Camp. As you click through the results pages, you may find that this is a minority view. This should be enough to give you an overall impression on the company, and help you decide whether it’s worth digging further. Every reputable company should have a strong social media presence. Take OddsMonkey as an example, with our Facebook, Youtube, Twitter, Linkedin and Instagram accounts. If a company can’t back up their claims, it’is unlikely they’ll be very active on social media. It’s the easiest way for unhappy customers to call them out. So it’s always worth digging into the comments on posts to see what the general feeling is that people have. If they don’t have a social media presence, but you’re still interested, you can use social media in other ways too. Platforms like Twitter have a search function. And what do people do when they’re disgruntled with something? A lot of the time they voice their concerns and dissuade their friends from making the same mistake. So searching Twitter for the company’s name is a great way of discovering information that will help you make a decision. The best companies are always transparent, willing to listen to your concerns and eager to answer them. 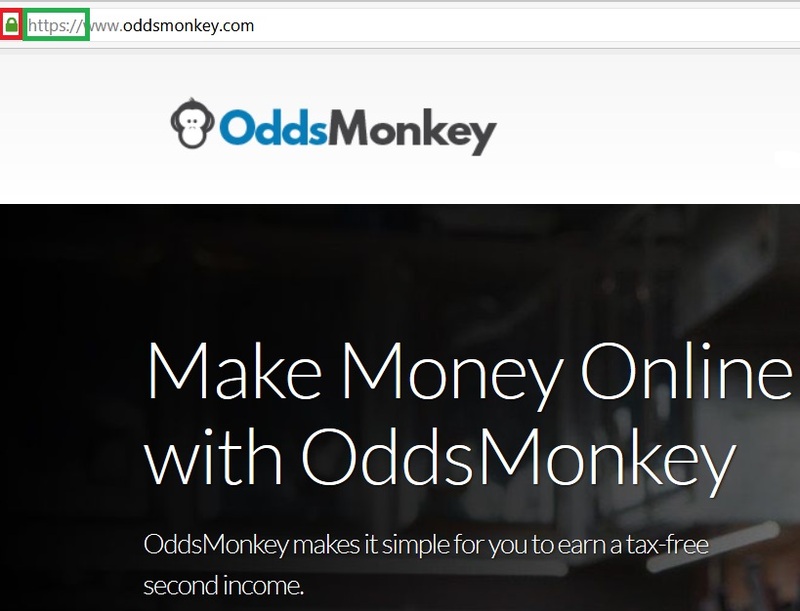 At OddsMonkey, we understand that the ‘make money online’ world can be confusing. So we’re always on hand to answer any questions to help you make sense of things. That’s in addition to the free guides and blog we provide. So, always reach out to the company you’re interested in with any questions. You should be made to feel like your questions are welcome. If you’re going to be giving your money and credit card details to a company, it’s important that they can be trusted with that information. So there are a couple of important things to look out for. The difference between a https:// and http:// prefix, is that websites with https:// have a security certificate. The S stands for ‘Secure’. While this isn’t a strong enough indicator on it’s own, scam websites are unlikely to bother getting a certificate. The payment page in particular needs to have the certificate, because this is where your most sensitive information is transmitted. In some browsers this will actually say the word ‘secure’. In others (as in the screenshot below) there’s a green padlock on display. If there is a grey padlock with a yellow warning sign or red strike through, this means that the connection is only partially encrypted but information can still be intercepted. In these instances you should probably refrain from using the website to submit any sensitive details. One of the biggest tell-tale signs of whether a company is legitimate is how professional their website looks. Poor English is the biggest tell-tale sign of a company’s legitimacy. If the English is poor, it may be an indication that they are based overseas but masquerading as a UK-based company in order to gain your trust. Plus, look for pages such as the company history, privacy statement and anything else that gives you an insight into the business. These pages are often overlooked, but give a great insight into the type of company they are. Typically, the more transparent the company is, the more you can allow yourself to trust them. Most companies in the ‘make money online’ niche will have a core product or method that isn’t unique to them. They may have unique advice, or put a unique spin on it, but the core foundations of the method will be the same. Take matched betting as an example. Many people are skeptical of it as a way to make money. Which is why at OddsMonkey, we work hard to show people that it is a legitimate way of making money, and can be very profitable. But if you didn’t want to take our word for it, you could use Google to see that people all over the internet are making money with matched betting. Perhaps though, you find a company that is advocating that you can make money online by starting an online shop and selling ice to Eskimos. Everything else about the company checks out, but your internal alarm is ringing like Big Ben at 00:00 on Jan 1st. Is anyone else online suggesting this as a great money making scheme? If not, it’s perhaps best to give it a miss. Beware of the number one tactic that people use to sell these services – the fear of missing out. If they put pressure on you and say there are a limited number of places, or that the opportunity won’t last forever – it’s simply a sales tactic.